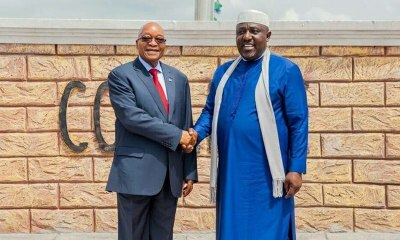 Rochas Okorocha, governor of Imo State, has said that he owes no one an apology for erecting the statue of South African president Jacob Zuma in Owerri, the state capital. Zuma had visited Owerri, Imo State, where he was conferred with a chieftaincy title and had a road named after him. According to Punch, a statement released by Okorocha’s Chief Press Secretary, Sam Onwuemeodo, said the erection of statues is to attract investments to Imo State. Okorocha claimed that had Zuma’s visit come when the People’s Democratic Party (PDP) was in power, schools and markets would have been shut down, and roads closed. (1) President of South Africa, Mr. Jacob Zuma was in Imo State, where God does new things on daily basis using Governor Rochas Okorocha as a veritable tool. He came on Friday, October 13, and left on Saturday, October 14, 2017. (2) While the good people of the State and all men and women of goodwill were celebrating the good things Mr. Zuma’s visit has brought to the State both in the short-run and in the long-run, the opposition in the State, out of glaring frustration decided to make much ado in the social media over the Statue of the Man in Owerri. Those of the former Vice President Dr. Alex Ekwueme and others had earlier been unveiled. (3) These enemies of our people did not see the good things associated with Mr. Zuma’s visit or what it portends for the State, for good, but only saw the statue that was erected as an encouragement to the man. (4) For the avoidance of doubt, when we talk about opposition in Imo, we are talking about only three people. And because they are only three, they recruited as many young people as possible and unleashed them on the social media. One could have twenty networks in different names just to deceive the general public. (5) Out of these three people that Constitute the opposition in Imo, two want to govern the State in 2019. One wants to install a governor from his zone in 2019. (6) Few days before the coming of President Zuma, we had told the world the reasons for his coming, and Principally for the signing of MoU between Jacob Zuma Education Foundation and Rochas Foundation College of Africa. (7) For that purpose, the Chairman of the Board of Trustees of Rochas Foundation College of Africa, former President Olusegun Obasanjo also came that Friday. We were at Sam Mbakwe International Cargo Airport when President Zuma landed at about 7:10pm. And it was a Celebration galore for men and women of good spirit present, especially seeing that the Imo International Cargo Airport has become a reality. (8) That night, he was at the Eze Imo Palace to be accorded Imo traditional way of welcoming such an august Visitor. (9) On Saturday, October 14, 2017, the signing of the MoU proper took place at the venue of the Rochas Foundation College of Africa between the Zuma Foundation represented by the Chairman of the Foundation Ms Dudu Myen and Rochas Foundation represented by Aham Okorocha, with the two leaders standing behind them. It was an emotional outing seeing indigent Children from all over Africa calling themselves brothers and Sisters. It was shown live on TV and well publicized. These enemies of good things kept mute. (10) In his emotion-laden speech at the event, President Zuma said “Africa can’t develop without education. The only way Africans can confront challenges imposed on them by the Colonial Masters is through education. The Founder of this Rochas Foundation is a true African, who has understood the problems of Africa and what to do to solve the problems. Rochas is beginning to solve the problems of Africa by educating Children from all the length and breadth of the African Continent”. (11) President Zuma Continued “I have found a real African brother who shares in my vision. I have agreed with him that we will Collaborate and make the foundation very strong and when we do, we may have found solution to African problems. I am proud to associate with another great visionary who has discovered therapy for African problems”. (12) To the African Children, President Zuma said “I believe each and every one of you has a history like me. If I can make it without seeing the walls of any School, you can make it even better because of the quality education you are getting in this Foundation”. At the end of his speech, he shook hands with some of the Students, which elicited emotional tears from those present. (13) In his own speech, Governor Okorocha said, “I am glad that the vision I had 17 years ago has grown in heaps and bounds. The Rochas Foundation Colleges have over 15,000 Students across the nation and over 4,000 graduates in different fields. As it stands today, I have dedicated 75% of my wealth to the Foundation. I have WILLED 75% of whatever I have to the Foundation. Every Child here is a story. Some of them their parents died of Ebola. They will all finish their Universities here and then go back to their Countries to contribute to the economic development of their Countries”. (14) After the signing of the MoU, President Zuma went into a very serious meeting with Imo businessmen and others from outside the State at the Ikemba Ojukwu Centre, including Leo Stan Ekeh of Zinox Computers, Dr. Pascal Dozie of Diamond Bank, Chairman of Innoson Motors, and a host of others. (15) At the meeting with South African delegation, it was agreed that the Sam Mbakwe International Cargo Airport would partner with South African Airline; approval was also extracted for the setting up of a South African Consulate in Owerri, which would entail travelers to South Africa now processing their visas in Owerri; and a Payment Centre also to be established in Owerri for easy business transactions; and partnership in the areas of Power, gas, agriculture and hospitality. These pieces of information were pushed out for Public Consumption. (16) After the meeting, the government of the State decided to encourage the South African President to do more and appreciate him for coming by honouring him with a Merit Award and erecting his statue. (17) And in his speech at the Award event and for the first time in recent time, President Zuma said “No South African must kill a Nigerian and no Nigerian must kill a South African. The relationship between Nigeria and South Africa should be stronger than any other part, for the sake of the Continent of Africa. Africans must come together to address African problems. We are the same people”. (18) Giving reasons for the Award, Governor Okorocha said “Today, we have decided to honour you for your love for education. Though you were deprived education in your early days in life, you are working to make sure that every poor Child went to School. Your love for education is the connection between you and the government and people of Imo State”. 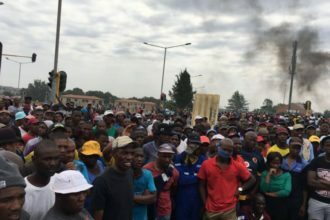 (19) Now, does it not call for pity for these elements who have chosen not to see the good stories or good news from Mr. Zuma’s visit but only decided to make much noise over a statue. Even to the extent of attaching non-existing cost to the statue. (20) And in case these “Galatians” do not know, if all we need to do to attract good things or investments to Imo is erecting statues, then, we have no option than to erect as many of such structures as possible. We owe no one apology. Rochas made a promise to open the doors of Imo to the rest of the world, for good and he is doing that and we cannot be deterred by these enemies of our people. (21) PDP in Imo is dead. The remaining people in the Party will soon join APGA because Imo people have Continued to ask them what they did with the 12 years’ mandate Imo people gave to them, beyond rampant Gala nights and drinking of Moet, Xo, Hennessy etal. And for two or three of such people in APC who think that they can make a headway by insulting the governor, we are only waiting and watching to see the extent they can go. (22) If it was in the days of PDP, Schools and Markets would have been shot down. And roads closed because President Zuma was coming. But none of such things was done because Rochas and his government have human face. The PDP for the 12 years they held sway never attracted any meaningful visitor to the State except PDP NEC members who were coming to loot the State. (23) In all these gimmicks, their target is 2019. And if calling Rochas Alhaji in Government House, and branding Imo Women, PDP widows against Rochas could not help them in the 2015 election, then, there is no guarantee that the noise over a statue of a man that brought good tidings to the State will in any way help them in 2019. (24) When the time comes, we will catalogue Rochas’ achievements and Challenge opponents or Contenders to display theirs. You do not ask for people’s mandate in the vacuum. There must be a basis for that. That is the edge we have over them in quantum. (25) If it was now, these same elements would have told Naaman not to obey Elisha by going to wash himself seven times in River Jordan. And he would not have got his healing over leprosy because they would have refused to see far. Imo State is on the fast lane of development. And those who want to remain behind can do so. We won’t wait for them. Imo is in the hand of God.